So as winter winds down, people start to breathe a sigh of relief; days feel longer, the fear of waking up to 20cm of snow is ebbing. So that means one thing: that’s right, Pied De Cochon Cabane à Sucre. If you aren’t familiar with the Pied de Cochon Cabane à Sucre, it’s a foodie’s dream come true. This dream is made up of a few ingredients, one part being foodie hero/saint aka Chef Martin Picard, add a generous portion of foie gras, some maple syrup, some duck, a little bit of meat pie, and 20 hungry people all ready to experience a culinary delight. 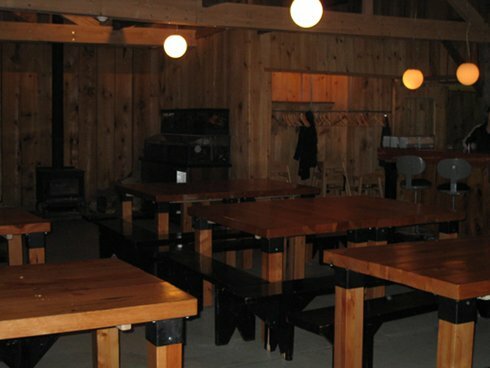 Cabane à sucre: that one time a year when we get together and have food you would never have any other time of the year; those classic meals dishes like tortière, omelettes, Oreilles de crisse, beans, sausages and others. Now, cabane à sucre food is not exactly brunch food, but it isn’t exactly lunch either so for this review we will make an exception. I should also note that we currently do not plan on going to every cabane à sucre since I can only handle so much line dancing music and hits from the 90’s at once. All this to say that we decided to do a classy cabane à sucre and by some cosmic power, I got a call recently from a friend saying that he had a spot for me at the Pied de Cochon cabane à sucre.